How would you like to entrust the care of your cat to a veterinary practice that loves cats as much as you do? What if that practice also provided excellent feline-centered care, acquired through years of study and experience? Well, that’s exactly what you’ll find at Exclusively Cats. We deliver top-quality veterinary care for that special cat in your life in a calm, feline-friendly environment. Our veterinary professionals are all avid cat lovers with expertise in both feline medicine and behavior. Since we know vet visits can be stressful for kitties and their parents, we do our best to provide a relaxed and positive experience. You will see the difference the moment you drive up to our hospital with its quiet, garden-like setting, conveniently located just a half block from Route 70 in Medford, NJ. If you are seeking a veterinary hospital with staff eager to treat your cat as one of their own, then look no further and contact us today. Click to Watch: Paws on Safety. One minute Pet Clinic. We offer veterinary services for cats and kittens and welcome anyone from the following areas. “ Her office supports her efforts and provides thorough and personalized attention to our and our cat’s needs. As testimony to her efforts my wife has commented to me on numerous occasions ‘I wish Dr. Dunkle could be my doctor!’ ” — John M.
The materials offered on this website are intended for educational purposes only. 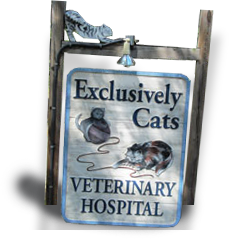 Exclusively Cats Veterinary Hospital does not provide veterinary medical services or guidance via the Internet. Please consult your pets’ veterinarian in matters regarding the care of your animals.